Radio Television of Serbia (Serbian: Радио-телевизија Србије or Radio-televizija Srbije; abbr. РТС or RTS) is the public broadcaster in Serbia. It broadcasts and produces news, drama, and sports programming through radio, television and the Internet. RTS is a member of the European Broadcasting Union. Radio Television of Serbia has four organizational units - radio, television, music production, and record label (PGP-RTS). It is financed primarily through monthly subscription fees and advertising revenue. Radio Belgrade began its broadcasts in 1929. The first news announcer in 1929 was Jelena Bilbija. The first radio program in Serbia was broadcast in February 1924, when released radio signal was transmitted from the transmitter in Belgrade suburb of Rakovica. After five years, on March 24, 1929 Radio Belgrade began with regular broadcasting of its program from the building of the Serbian Academy of Sciences and Arts. Radio Television Belgrade (RTB), consisting of Radio Belgrade and Television Belgrade (TVB) was established as a result of the decision by the Executive Council of the Socialist Republic of Serbia on 13 February 1958. This came after the Socialist Federal Republic of Yugoslavia's government decision of 1956 to invest in a television network. The first televised broadcast was on 23 August 1958, an edition of the Dnevnik (Journal) news programme with Miloje Orlović, Branislav Surutka, Olga Nađ, Olivera Živković and Vera Milovanović. The first RTB program was broadcast from the Belgrade Fair and from a new TV Studio build there. From 1961, RTS began to use quadruplex video tape recording equipment. The Sixties saw dramatic development in all genres of TV programs. TVB became famous by its sitcoms (directed and written by Radivoje-Lola Djukić, Novak Novak and others (unfortunately, only a small proportion is preserved, owing to implicit censorship and shortage of tapes). Also, TVB had excellent documentary programs (series Karavan, Reflektor and others) and quizzes. By 1970, the entire territory of Serbia was covered by the RTS signal. On 31 December 1971, TVB started broadcasting in PAL color system on its second network. A new AM (radio) broadcast equipment in Zvečka, Obrenovac, with 2000 kW transmitter was erected in 1976. After the political turmoil in the 1970s (against the "liberals") the program of RTB became more sterile, however, in the 1980s it reached the zenith. In 1989, preparation for the formation of the RTS system officially began. That same year, 3K TVB started broadcasting as the youth, alternative TV channel. Along with it, Radio 101 started broadcasting in Belgrade and Vojvodina. Radio 101 was the more commercial youth radio, carrying pop and turbo-folk hits. It was intended to complement the more alternative Belgrade 202. In 1990, a few regional studios (Niš, Kragujevac, Jagodina, Šabac) officially started broadcasting regional programming via a window in place of "Beogradska hronika". In 1991, all public broadcasters started their merger into RTS. The establishment of Slobodan Milošević's regime led to one of RTS's most troubled eras in its history. Hundreds of journalists were fired for not complying with Milošević's propaganda. During the protests of 9 March 1991 the regime's opposition attacked the RTS building, calling it a "TV Bastille". In 1992 Radio Television Belgrade (RTB), together with Radio Television Novi Sad (RTNS), Radio Television Pristina (RTP) and many local government owned radio stations, became part of RTS, a centralized and closely monitored media network intended to be a propaganda tool for Milošević and his government. The most notorious of the network's TV programming during the Milošević era was Dnevnik (Daily News), which was used to glorify the "wise politics of Slobodan Milošević" and to attack "servants of Western powers, forces of chaos and despair", or the Serbian opposition. Serbian media during Milošević's era was accused by The New York Times of embracing Serbian nationalism and promoting xenophobia toward other ethnic groups in the former Yugoslavia. Serbian state media during the wars featured reports which demonized Bosnians and Croats. The negative media depictions of said ethnic groups are examples of Milošević's state media promoting mass hysteria and to anger Serbs to support the Yugoslav Wars. The station drew little attention to Serbian war crimes committed against Croats and Serbs. Reports about Serbs being massacred by Bosniaks and/or Croats were broadcast daily in order to inflame the Serb and Montenegrin populace. Examples include the U.S. embassy reporting of falsified stories created by state media of Bosnians and Croats killing nuns and babies. During the Bosnian war, when Sarajevo was under siege, RTS newscasts showed a still photo from Sarajevo in the 1980s, untouched, in order to create the image that the city was not under siege. During the Kosovo war, Serbian state media denied the Gornje Obrinje massacre and the Vučitrn massacre, committed by Serb paramilitaries and Serbian police against Albanian civilians on 26 September 1998 and 2-3 May 1999, respectively. A Serbian television report described the BBC accounts of atrocities committed by Serbian police in Kosovo as "lies and manipulation." In addition, RTS never reported the 800,000 Kosovar Albanians expelled by Serbian police and paramilitaries in Operation Horseshoe, except when a convoy of fleeing Kosovars was killed by NATO bombs. 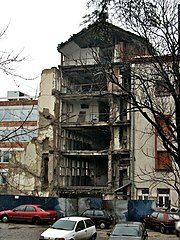 On 23 April 1999, NATO bombed the RTS headquarters in downtown Belgrade, killing sixteen people, mostly technicians. In 2002, Dragoljub Milanović, the general manager of RTS, was sentenced to ten years in prison because he had failed to order the workers in the building to evacuate, despite knowing that the building would be bombed. Amnesty International has described the NATO attack as a war crime. On 5 October 2000, the RTS building was demolished and partly burned during the riots against Slobodan Milošević. For some time after 5 October 2000, RTS was officially rebranded Nova RTS (New RTS) to symbolize liberation from control from Milošević's regime and to symbolize a rebirth in the broadcaster's history. After Milošević's removal from power, RTS underwent reconstruction in order to regain respect amongst much of its audience which the network had lost during the '90s. Particular emphasis was put on news programming which suffered greatly during the '90s. In 2006 RTS became the most viewed television network in Serbia and has retained this position since then. Early that year, RTS decided to shut down one of its television channels. 3K (Treći kanal RTS-a) was a channel dedicated to the youth, which, however, became the main film, series and sports channel in the late 1990s and the early 2000s.. In 2007, the BBC World Service Trust launched an extensive training programme at Serbia's national broadcaster. This 30-month project, which was funded by the European Union, provided extensive journalism, craft and management training to all levels of staff at the broadcaster. In 2008, RTS underwent major changes as it celebrated 50 years of existence. The network launched its digital network which uses DTT Digital terrestrial television via several DVB-T transmitters. It has also invested millions in new technology. The new high-definition television system was first put in place in May for the 2008 Eurovision Song Contest while on 26 November 2008, RTS began airing its new channel ‘’RTS Culture and Arts’’ which is a DTT-only channel, transmitted in 16:9 standard definition format, with stereo and 5.1 digital audio. During 2008 the networks web presentations was greatly improved. On 23 August 2008, the 50th anniversary of Dnevnik (the RTS news bulletin) was celebrated. A special edition of the 19.30 Dnevnik was aired with Mića Orlović, the first newsreader to host the news in Serbia, hosted the special addition helped by Dušanka Kalanj, the first female newsreader in Serbia. The theme of the evening's news included a reflection on the past 50 years a projection of the future as well as the news of the day. The weather was read out by Kamenko Katić, the first weather forecaster. All babies born on 23 August 2008, received a flat screen television set from RTS. On 9 September 2009, at 21.00 CET, RTS launched its first high definition channel – RTS HD. RTS was the host broadcaster of the semi-final and finals of the Eurovision Song Contest 2008. Serbia gained the rights to host the contest after Marija Šerifović's 2007 victory in Helsinki, Finland. The Eurovision Song Contest 2008 was held in Belgrade. RTS broadcast the event as usual (since 2004) on RTS1. The host couple were Jovana Janković and Željko Joksimović. The rating of the final of Eurovision was overwhelming with 4.560.000 people tuning in to watch making it the most watched event on Serbian television as well as on RTS. In 2011, RTS issued a written apology to the citizens of Serbia and former Yugoslavia for its actions during the regime of Slobodan Milošević and the break up of Yugoslavia. The letter apologises for the network’s senseless reporting and the hurt it caused to the public. It vows never to let history repeat itself. On 23 August 2014, at the 56th anniversary of the broadcaster, RTS got a new visual identity: focusing on new on-screen logos introduced on 18 February for their terrestrial channels. At the same day, the watermarks changed themselves to fit into the 16:9 format. RTS has two TV centers: in addition to the main TV production center within RTS headquarters complex in the downtown Belgrade, there is also TV production center in Košutnjak (housing two largest studios: Studio 8 and Studio 9). RTS offers live programming on its website. RTS1 is the oldest television station in Serbia, launched on 23 August 1958. It is available nationally free-to-air and is the most watched television channel in the country beating the other two most popular television networks in Serbia, RTV Pink and Prva. RTS1 offers viewers political shows and debates and domestic and international shows. RTS1 airs a range of locally produced dramas, which are among the most watched television shows in Serbia. RTS2 is first colour television station in Serbia, launched on 31 December 1971. Available nationally free-to-air, it focuses on educational programmes and sporting events. Parliamentary sittings are also broadcast live on RTS2. RTS3 is first digital-only channel which began broadcasting on 26 November 2008 as RTS Digital. The channel, available nationally free-to-air, mainly airs cultural programmes, with emphasize on music (classical musical and jazz performances, in particular) broadcasting various concerts as well as ballet performances. Among other things, the channel broadcasts the Vienna New Year's Concert and the Eurovision Song Contest live each year. RTS HD, the first high-definition television channel in Serbia, launched on 9 September 2009. It is available only through cable and satellite services. RTS SAT, launched on 14 May 1991, is the satellite service created to serve the Serbian diaspora across the world. It broadcasts the most popular programmes from RTS1, RTS2 and RTS3. RTS SAT now covers Australia, Europe, North America and Eurasia (Russia, Belarus, Kazakhstan, Armenia). News programmes are produced in Belgrade, however the network has a total of 25 news offices in the country. RTS also has its own correspondents and offices outside of Serbia in: Moscow, London, Brussels, Paris, Rome, Vienna, Washington, D.C., Chicago, and Tokyo. RTS has the most watched news and current affairs programmes in the country, according to the AGB Nilsen Serbian ratings. The centerpiece of RTS news programming is the Dnevnik (English: Journal), which is the network’s main news programme and is aired on RTS1. The Dnevnik bulletins are aired at 8:00 (runs for approximately 25 minutes), 12:00 during workweek and 13:00 Saturdays and Sundays (around 15 minutes, excluding Sports Review and Weather forecast), 19:30 (between 35 and 40 minutes) and at 23:00 (approximately 20 minutes). The flagship (evening) Dnevnik has been the most watched news programme in Serbia since 2003, averaging between 1.5–2 million viewers nightly. The RTS entertainment is largely based on local production of Serbian drama programmes, soaps and musical programmes. Recently RTS has started investing more in local drama and as a result has been rewarded with high ratings. An episode of the RTS drama Ranjeni orao aired on 15 January 2009, is the most watched scripted drama episode in Serbian broadcasting history with over 3 million viewers. RTS also broadcasts various world entertainment events as part of its entertainment programming including the Vienna New Year's Concert and Academy Awards ceremony. The network has transferred a lot of its cultural programming and documentaries, originally broadcast on RTS2, to the RTS3. The network holds rights to air major entertainment events such as the Eurovision Song Contest ad Junior Eurovision Song Contest. In 2008, RTS produced the 53rd Eurovision Song Contest. RTS also relies on dramas and soaps produced outside of Serbia as well as documentary programmes. RTS is a major player in Serbian sports broadcasting. Major sporting events are aired on RTS1, especially if a Serbian team or athlete is participating while all other sports broadcasting is aired on RTS2. The network has several shows which are specially dedicated to sports, aired on both RTS1 and RTS2. RTS broadcast its first Summer Olympic Games in 1996 (previously the Olympics were broadcast in Serbia through Yugoslav Radio Television, JRT) and has held broadcasting rights for both the Summer Olympic Games and Winter Olympic Games ever since. RTS also holds rights to broadcast the FIFA World Cup, UEFA European Championship, FIBA World Cup, EuroBasket, FIVB Men's World Championship, FIVB Women's World Championship, FIVB Volleyball World League, European Men's Handball Championship, European Water Polo Championship, IAAF World Championships in Athletics, European Athletics Championships, Davis Cup, Fed Cup, Wimbledon, Roland Garros, US Open, Australian Open, etc. It has exclusive rights to the Serbian Cup football matches. TV Slagalica (TV Puzzle) is the longest running quiz show in the Balkans. It has been on RTS programming for over 20 years and has always had a solid ratings. Bolji život (A better life) is one of the most iconic Yugoslav shows ever produced. Made during the '80s and '90s it works through the problems of a few families. The show brought in huge ratings for the network during its dark days of the '90s and after the production of the show ceased RTS has continually re-run the series. Otpisani (Disposable Heroes) is a 1970s Serbian TV series, aired on RTS, based around youths from the resistance movement in Nazi-occupied Belgrade that are high on the Gestapo's termination list. The series has achieved something of a cult status among its audience. The television series has been encored a total of seven times. Srećni ljudi (Happy people) is the most successful, long running, television series aired between 1993 and 1996. The most watched drama series in Serbia. Ranjeni orao (Wounded eagle) based on the novel by Serbian author Mir Jam, the 17-episode show premiered in December, 2008. Produced by Zdravko Šotra, the show had a cast of popular Serbian actors, most notably Sloboda Mićalović, Ivan Bosiljčić and Dragan Nikolić. The show is based in the Kingdom of Yugoslavia between the two world wars and centres around the love life of Anđelka Bojanić. The show received extremely positive critical reviews and outstanding ratings. The show’s final episode on 19 January 2009 was watched by 3,277,000 people, making it the most watched television show in Serbia. Due to viewer requests, once the show ended it was immediately reprised in primetime, making it the fastest repeated show on RTS. In its repeats it also managed to produce extremely high ratings. RTS operates 4 radio stations, under the name Radio Belgrade. Radio Belgrade 1 is flagship channel which provides comprehensive news and current affairs programmes to the public as well as entertainment and culture shows. Radio Belgrade 2 is a cultural station based around social dialogue which constantly broadcasts thoughts about life and creation abroad and in Serbia. The station is known for documentary reporting, religious discussions classical music, evergreen, jazz and satire. Radio Belgrade 2 shares the same radio waves as Radio Belgrade 3 and is broadcast from 6:00 until 20:00. Radio Belgrade 3 focuses on classical music and radio dramas. Radio Belgrade 3 shares the same radio waves as Radio Belgrade 2 and broadcasts from 20.00 until 06.00. Radio Belgrade 202 broadcasts short news segments, rock and pop music. Hosts of various music programmes on the radio often ask listeners to send in their thoughts via SMS or the Internet. Belgrade 202 also has a special morning programme broadcast from 06.00 until 09.00. which is based around current cultural, social and political trends. RTS has an archive of its TV programmes. In addition to 5000+ video tapes in the long obsolete quadruplex format, the archive contains tapes in C-type helical scan, U-matic, beta-SP and digital formats. Also, the archive contains an extensive collection of newsreels, short filmed stories, and feature films on 16 mm and 35 mm tapes. PGP-RTS is a music production company owned by the television network, starting with production in 1958 under the name PGP-RTB and used to be one of two largest record labels in the former Yugoslavia. Today, it is the third largest record label in Serbia (after Grand Production and City Records). ^ a b c "Analiza medijskog tržišta u Srbiji" (PDF). rem.rs (in Serbian). August 2015. Retrieved 30 September 2018. ^ a b "Bilans uspeha (2017) - RTS" (PDF). apr.gov.rs (in Serbian). Agencija za Privredne Registre RS. Retrieved 30 September 2018. ^ "Consumer protection group wants TV fees abolished". B92. 25 June 2012. Archived from the original on 19 October 2013. Retrieved 12 June 2013. ^ "Serbian state media begins to waver in its support of Milosevic". Committee to Protect Journalists. 4 October 2000. ^ Jane Perlez (10 August 1997). "Serbian Media Is a One-Man Show". The New York Times. ^ "Serbs attack Kosovo massacre reports ", BBC News, 1 October 1998. ^ "Yugoslavia: Ex-TV Boss Jailed Over NATO Bombing". The New York Times. 22 June 2002. ^ "No justice for the victims of NATO bombings". Amnesty International. 23 April 2009. Retrieved 13 August 2013. ^ "Transforming national broadcasting in Serbia". BBC News. 4 October 2007. Archived from the original on 8 February 2008. Wikimedia Commons has media related to Radio Television of Serbia.